Chelsea are reportedly leading the likes of Arsenal and Barcelona in the race to sign Luka Jovic from Eintracht Frankfurt in the summer. The 21-year-old joined the Bundesliga side on a two-season loan deal from Benfica last year and he has since impressed with 23 goals in 37 appearances for the club. As such, Frankfurt are certain to trigger the buy option available in his contract in the summer, but they could thereafter face a battle to keep hold of his services for another term. According to AS, the likes of Arsenal and Barcelona have been monitoring the proceedings of the marksman, but the Blues remain the frontrunners to sign, provided they can either freeze or overcome their transfer ban. Still, the Serbian won't come on the cheap and Frankfurt are expected to demand a fee of at least £67m in order to part ways with the upcoming star. 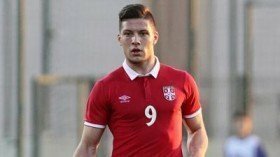 Jovic has earned four caps with the Serbia national team to date.